Quebec (/kwɨˈbɛk/ or /kəˈbɛk/), French: Québec ([keˈbɛk] ( listen)), an aw Québec, Quebec Ceety or Québec Ceety (French: Ville de Québec) is the caipital o the Canadian province o Quebec an is locatit athin the Capitale-Nationale region. It is the seicont maist populous ceety in Quebec efter Montreal, which is aboot 233 kilometres (145 mi) tae the soothwast. ↑ 3.0 3.1 "(Code 2423027) Census Profile". 2011 census. Statistics Canada. 2012. ↑ 4.0 4.1 "(Code 421) Census Profile". 2011 census. Statistics Canada. 2012. ↑ Accordin tae the federal an provincial governments, Québec (wi the acute accent) is the ceety's offeecial name in baith French an Inglis. 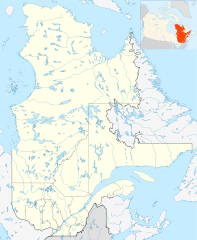 Even though French place names in Canadae typically retain their accents in Inglis an the ceety's name is not among 81 locales of pan-Canadian significance with official forms in both languages, as is the case wi the province o Quebec/Québec, Quebec is a legitimate an well-established exception in Inglis (as is Montreal). Similarly, Quebec CIty is common (e.g., per the Canadian Oxford Dictionary (ISBN 0-19-541816-6, p. 1265)), and is used particularly to distinguish the city from the province. According to Editing Canadian English (ISBN 1-55199-045-8, p. 77) the form Québec City makes no sense in either English or French; nonetheless, it is used by the municipal government and other sources (e.g., Québec City Jean Lesage International Airport). Wikimedia Commons haes media relatit tae Quebec City. This page wis last eeditit on 11 Januar 2019, at 14:19.